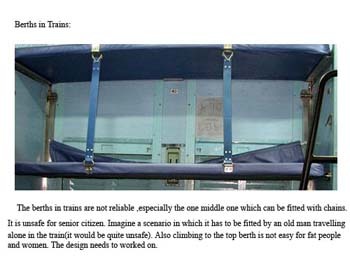 The berths in the train seem to be quite unsafe as they are fitted with chains which adds to the feeling of insecurity. It becomes very difficult for women and elders to climb over it and have a good nights sleep. Abhijit: Wah! What an observation! Shabash!!! Vivekanand Raula: Hi Venkat, good catch. I wish you all the very best.